Meet one of our new 2019 Ambassadors…..Rachel Lotz! My first OCR Race was the Seattle Super in 2016, I really had no idea what I was getting myself into. My dad had bought us tickets for one of the Open Heats on GroupOn, called me up and told me we would be headed to Seattle that weekend. Often the challenges that you face in OCR are much similar to the ones you face in life. You can prepare as much as possible, but somehow there will always be something that you were’t expecting. OCR has helped me overcome a very heated temper. I have found that in the big picture (whether that be an important race or in life), some things really just don’t matter. However, the way you treat others and your reactions in those certain situations do matter. I love how diverse the OCR Community is. There is no better feeling than being in different states or even different parts of the globe for races, and knowing that you are connected to one big family. I would have to stay that the women of OCR inspire me. Typically you think of running, and lifting heavy things as a man’s sports – but the women out there are totally kicking some a**, especially in endurance races. My favorite OCR memory would be finishing the 2018 Death Race, and gluing together my finisher’s skull. I was pleasantly surprised with the generous amount of support received via the live streams and social media both during and after the race was finished. I am hoping to get on the podium at the Portland Sprint this year, I placed a close 4th place this past year, and would like some redemption on my home turf. I would also like to try out some new races – whether that be Tough Mudder, Green Beret or Ragnar. We work hard to improve our physical selves which is important in racing and a healthy life. I wanted to also focus on other aspects that can help make us be well rounded in our racing and personal lives. Each month I’d like to choose a topic from the Spartan Seven Pillars above and then offer a challenge to you. You have an entire month to work on it. Research shows that lasting changes often occur when you take things slow and do one step at a time. This month we are going to select Mind. One Word! This is something everyone can do to direct your life in a positive way and keep moving forward. It’s easy to get distracted from the New Year’s resolutions you make and good intentions. This can be used to help you focus all year long. I highly recommend getting the book so you can really dive in and learn how to choose your word and make it stick. My word is Strength. I’m going to apply it to all parts of my life. Strength in body, mind, and soul. I’m going to write my word down on sticky notes and place them in areas I will see them, so it will become engrained. This word will be my focus all year. Physical strength. Strength in helping others. Strength in proper eating. Strength during trying times. Strength in finding ways to make others happy. Here is a video by the writer that gives a brief overview. There’s a word meant for you. When you Find it, live it, and share it… Your life will become more exciting and purposeful than ever. One Word is a great little book that conveys a profoundly simple idea. Discover your One Word for the year, own it, live it, and experience its impact on your life. One word for this book: Priceless!” Ken Blanchard, coauthor of “The One Minute Manager” and Leading at a Higher Level My wife and I read One Word and we loved it! My favorite word for this book is Powerful! Read it today and discover the power of One Word! – Lou Holtz former Head Coach of the University of Notre Dame. 98% of the pistachios produced in the United States are from California. 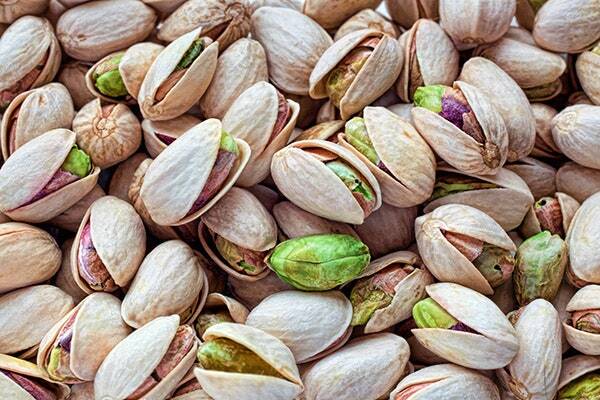 Iran is the largest producer of pistachios in the world. February 26 is National Pistachio Day. Pistachios are one of the oldest flowering nut trees, and are one of the only two nuts mentioned in the Bible (Genesis 43:11). Humans have eaten pistachio nuts for at least 9,000 years. According to legend, pistachios were featured in the fabled Hanging Gardens of Babylon, built about 700 B.C. by King Nebuchadnezzar for his wife Amytis. In the first century A.D., Emperor Vitellius introduced Rome to the pistachio. Apicius, Rome’s Julia Child of the first century, includes pistachios in his classical cookbook. Slice beets fairly thick, about 3-4 slices per beet if they are large. Arrange on a plate. Cut cheese into pieces and place on each beet. Shell pistachios and place between paper towels. Crush slightly with a glass or something heavy. Sprinkle nut pieces over top of beets and cheese.